TCP connection establishment occurs before any of the other TCP features can begin their work. Connection establishment refers to the process of initializing sequence and acknowledgment fields and agreeing to the port numbers used. Figure 6-8 shows an example of connection establishment flow. This three-way connection-establishment flow must complete before data transfer can begin. The connection exists between the two sockets, although there is no single socket field in the TCP header. Of the three parts of a socket, the IP addresses are implied based on the source and destination IP addresses in the IP header. TCP is implied because a TCP header is in use, as specified by the protocol field value in the IP header. Therefore, the only parts of the socket that need to be encoded in the TCP header are the port numbers. TCP signals connection establishment using 2 bits inside the flag fields of the TCP header. Called the SYN and ACK flags, these bits have a particularly interesting meaning. SYN means "synchronize the sequence numbers," which is one necessary component in initialization for TCP. The ACK field means "the acknowledgment field is valid in this header." Until the sequence numbers are initialized, the acknowledgment field cannot be very useful. Also notice that in the initial TCP segment in Figure 6-8, no acknowledgment number is shown; this is because that number is not valid yet. Because the ACK field must be present in all the ensuing segments, the ACK bit continues to be set until the connection is terminated. TCP initializes the Sequence Number and Acknowledgment Number fields to any number that fits into the 4-byte fields; the actual values shown in Figure 6-8 are simply example values. The initialization flows are each considered to have a single byte of data, as reflected in the Acknowledgment Number fields in the example. Figure 6-9 shows TCP connection termination. This four-way termination sequence is straightforward and uses an additional flag, called the FIN bit. (FIN is short for "finished," as you might guess.) One interesting note: Before the device on the right sends the third TCP segment in the sequence, it notifies the application that the connection is coming down. It then waits on an acknowledgment from the application before sending the third segment in the figure. Just in case the application takes some time to reply, the PC on the right sends the second flow in the figure, acknowledging that the other PC wants to take down the connection. Otherwise, the PC on the left might resend the first segment over and over. TCP is indeed connection oriented because of the set of three messages that establish a TCP connection. 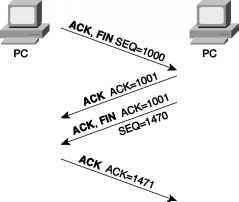 Likewise, Sequenced Packet Exchange (SPX), a transport layer protocol from Novell, is connection oriented. When using permanent virtual circuits (PVCs), Frame Relay does not require any messages to be sent ahead of time, but it does require predefinition in the Frame Relay switches, establishing a connection between two Frame Relay-attached devices. ATM PVCs are also connection oriented, for similar reasons. NOTE Some documentation refers to the terms connected and connection-oriented. These terms are used synonymously. 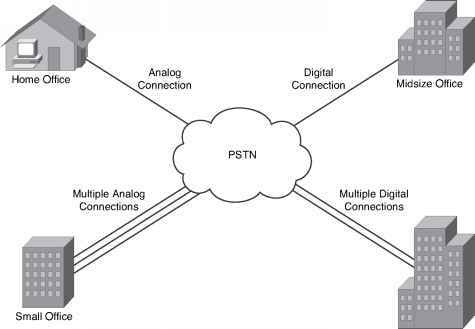 You will most likely see the use of the term connection-oriented in Cisco documentation. Many people confuse the real meaning of connection-oriented with the definition of a reliable, or error-recovering, protocol. TCP happens to do both, but just because a protocol is connection-oriented does not mean that it also performs error recovery. Table 6-4 lists some popular protocols and tells whether they are connected or reliable.